I am very lucky to be given the opportunity by Jakub Dvořák and Jaroslav Švejkovský to purchase copies of his latest releases before they are generally available for the public. This is partly to allow me to review them in advance and also because Jakub occasionally likes me to write something for his store when the designer of the puzzle doesn't speak English well enough to write something for him. 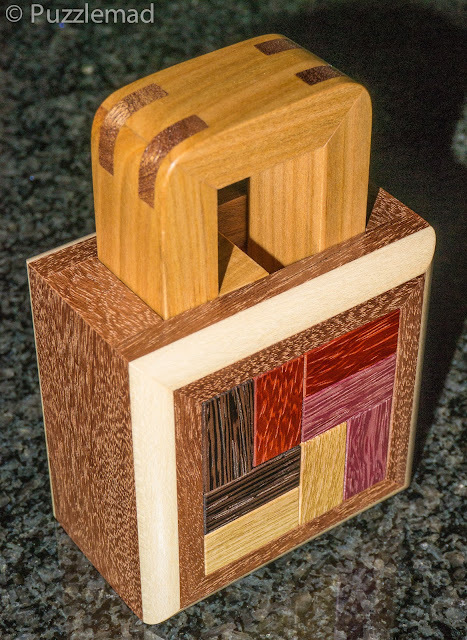 These puzzles have just been made available at the New Pelikan Workshop morning - don't miss out - as a short review...they are FABULOUS! I received these just over a week ago and have been working my way through them - I have to say that they are all as stunning and as beautifully made as ever. Jakub and Jaroslav maintain their place as probably the best wood craftsmen in the world. 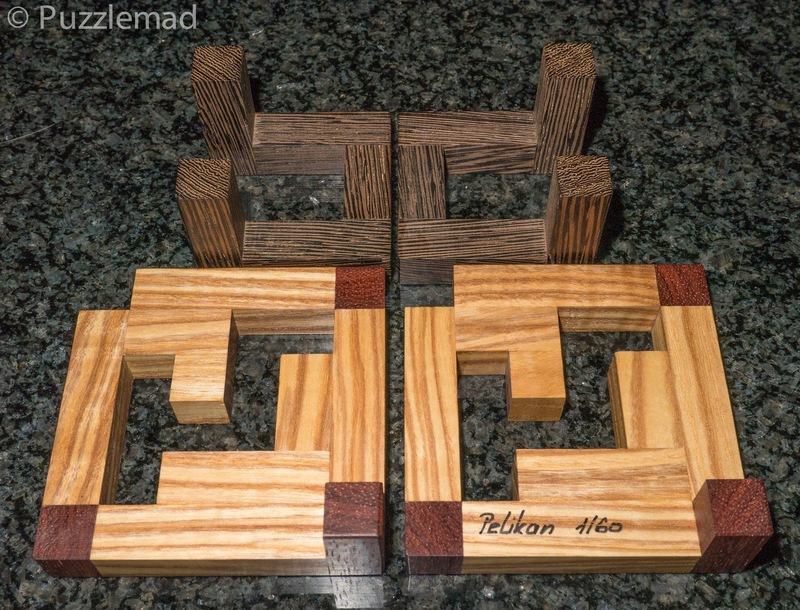 The fit and finish of these puzzles is unbelievably good. Despite having such perfect tolerances there is never a sensation of pieces catching on each other as pieces move. The Apollo is another delight from the mind of Osanori Yamamoto. It consists of 3 shapes straddling a wooden frame to make the shape of a rocket (hence the name). Only 3 pieces in the frame? Easy? Not really! As with many of Osanori's puzzles, this requires several rotational moves to remove the pieces which makes it a nice fun challenge. It is not as tough as the others in this release but certainly requires a fair bit of thought to figure out where to move them so that rotations are possible and then work out which direction to turn. It did not take me very long but there is a very nice Aha! moment when discovering a rather unexpected position to do the rotations and also another fun challenge working out the reassembly after scrambling and leaving the pieces. 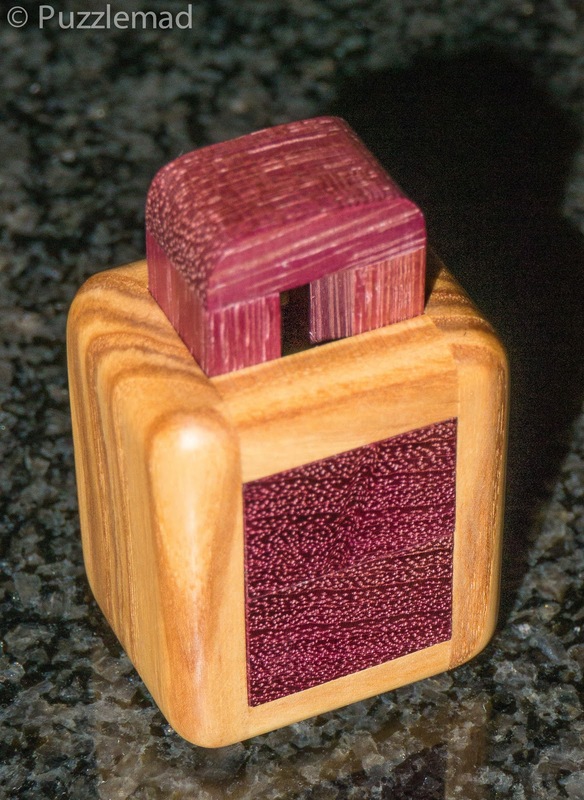 The Neo Saturn designed by Osanori Yamamoto looks simply stunning made from Acacia, Wenge, Purpleheart and Padauk. The circular planet/sun on the top is there to ensure the correct orientation during reassembly and really adds to the beauty of the piece. 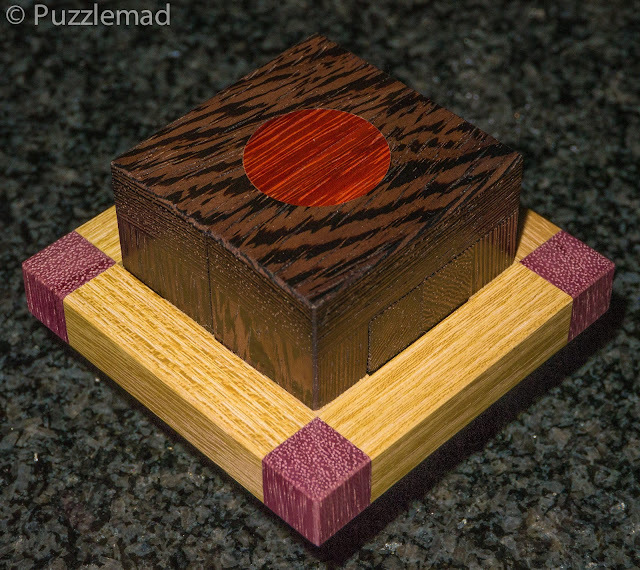 This puzzle is classic Osanori - quite a few rotational moves with a maze of setup moves to reach the correct positions. Everything is beautifully made and the sliding of the pieces on the frame is smooth as silk. The Aha! moments are delicious and make this one of the most enjoyable puzzles in this release. Reassembling the puzzle is possible from scratch and is just as much fun. This one has become a fun toy to play with in quiet moments for me. Stunning workmanship and a beautiful design. The Aqua Toto puzzle is my 2nd favourite from the group to be released. This is also a classic Osanori Yamamoto design consisting of a 2 piece frame and 2 Wenge pieces which straddle it. 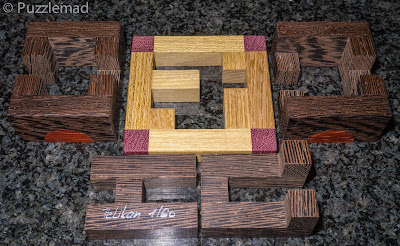 Separating the pieces requires that the 2 frame pieces are moved and the Wenge L's be negotiated through a changing maze to a position which allows the characteristic rotation moves. The rotational moves came to me in a completely unexpected position and there was also something else about it that I found wonderfully startling. Further moves and further rotations lead to another rather unexpected Aha! moment. It took me quite a while to reassemble these after scrambling and leaving the pieces for a while. This is a truly satisfying puzzle. Not for beginners but all experienced puzzlers will enjoy the sequence and the surprise moves in this one. What is the surprise move? If you have solved it and are not sure what is so surprising or don't plan on buying it but want to know anyway then click the button to reveal the hint. 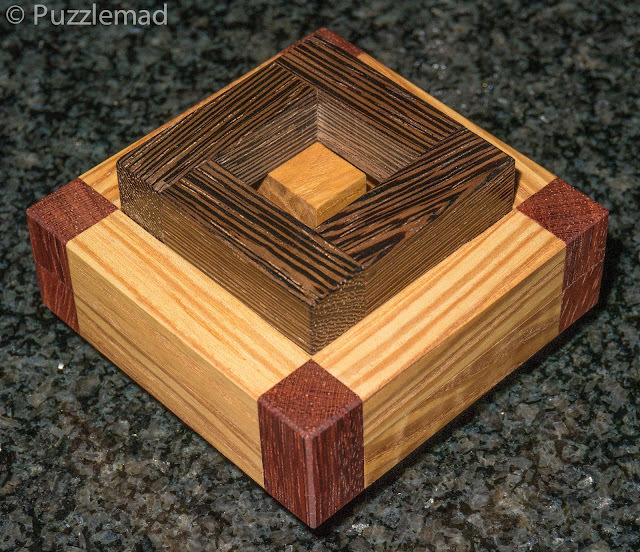 If you organise all the moves and positioning just right then the two Wenge pieces will rotate at the same time. Then some more reorganisation and they will rotate at the same time again to be released from the frame. It is a fabulous Aha! moment which made me gasp out loud when I worked it out. Brilliant design by Osanori! Mini Lock - Looks huge but is only 5cm high. Christoph Lohe has designed many many burrs over the years and they all share the common feature that they have something rather interesting and unusual about them. He has designed several burrs in the shape of locks. The Burrlock E was made by Eric Fuller and reviewed enthusiastically by me here. I was delighted to see that another couple of his locks were going to be released by the New Pelikan Workshop this time. The Mini Lock is so named because of the small number of pieces and supposedly "simple" sequence to disassemble as well as the diminutive size of the puzzle at 5cm tall. It is beautifully made with very tactile curves on the edges. Looks easy? Ahem! Maybe for you, it will be! Having disassembled it so quickly, I decided to scramble the pieces without properly examining them and leave them a while before trying to put it back together. Yours truly showed himself to be not terribly bright when it came to the reassembly as it took me over half an hour to work it out. 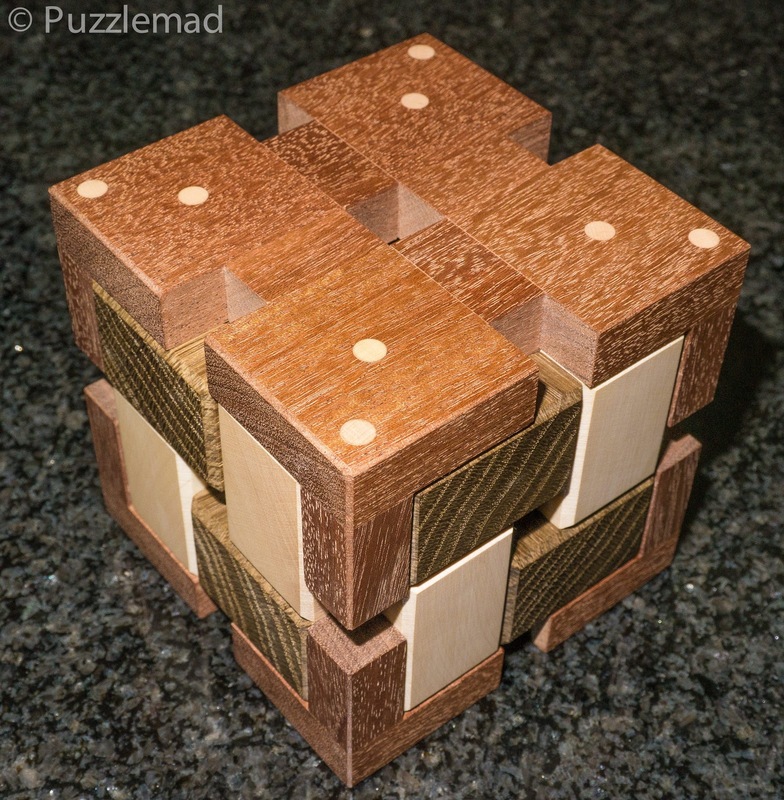 It is a very logical puzzle and can be worked out from scratch - a great fun challenge. 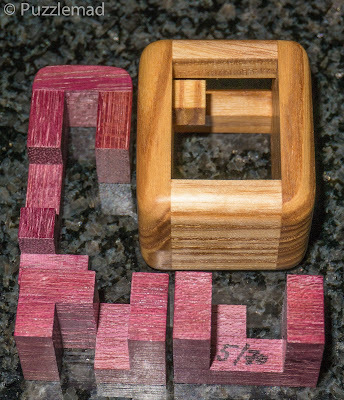 This is a perfect little pocket challenge for every puzzler. Having taken this apart at work I had to go and do something (I think I had finished a short coffee break and had to wake my patient up before starting the next one) - when I got back to the pieces of the puzzle and took them out of the bag I had used to temporarily store them in, I discovered that the reassembly was a tremendous challenge! In fact, I could not do it until I got home and had a fair bit of time in the evening to play. I had to backtrack my disassembly to work it out and then work out which pieces went where. It is manageable and is a great challenge for those of us not good at reassembly. This puzzle is beautiful and brilliant! 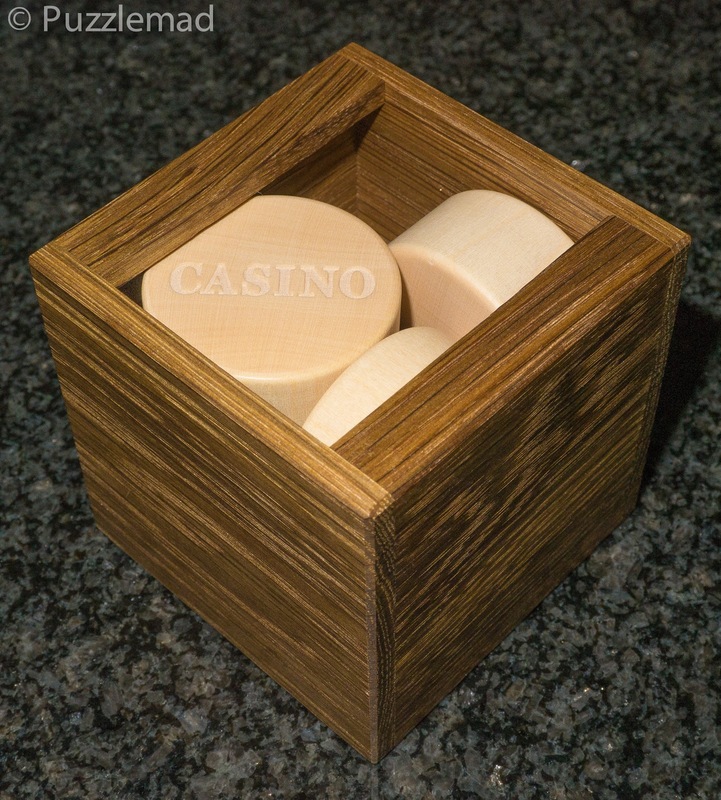 Casino - just put the chips into the box! Casino is an absolutely fantastic packing puzzle by Volker Latussek, a designer I came across for the first time at the Paris IPP. He had entered another Packing puzzle into the Design competition which I really enjoyed (in fact it got one of my votes). The Bastille is available in continental Europe from Rombol here - I really wish they would find a retailer who would sell in the UK as I struggle to get these puzzles here. 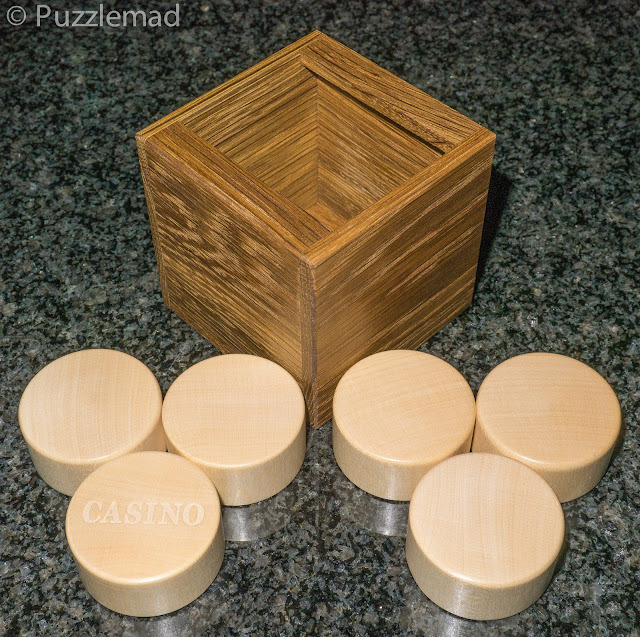 The Casino is just as simple a premise as the Bastille - put the pieces in the box so that they don't protrude outside. Easy? Hell no! The chips and box are wonderfully tactile and just beg to be played with. Everything can be stored nicely in the unsolved position and then tipped out for play when ready. 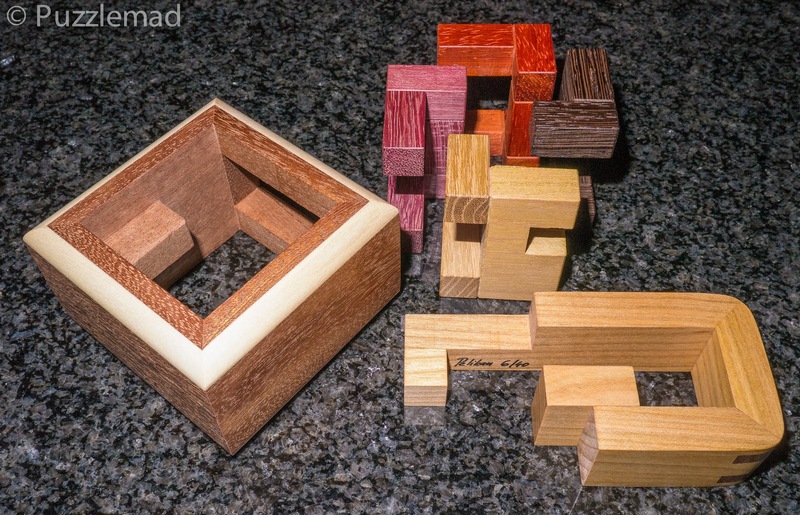 This puzzle would be simple if it wasn't for the lip overhanging the top of the box. It takes a few minutes to work out the arrangement required so that the pieces will physically fit inside but getting them in there is another thing entirely! 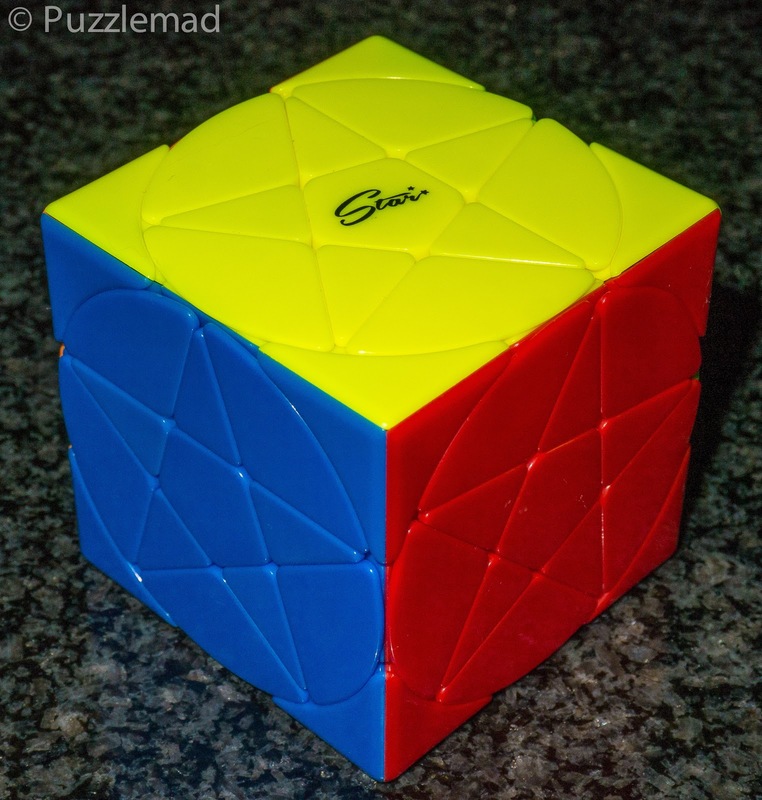 I couldn't resist this one - I played with it alongside Mrs S at the breakfast table on the morning that it arrived and she watched me with great amusement as I progressively failed to solve it over about an hour. She didn't seem to mind the muttering/talking to myself and at one point exclaimed that it didn't look that hard and snatched it from me to have a try herself! I didn't mind - whilst she is a rather bright cookie, she is not a puzzler and it was soon my turn to laugh at her as she failed to get the last piece inside. To her credit, she did work out the correct arrangement but could not get it past the lip. After 10 minutes she gave up in disgust and said it was impossible! Hehehehe! After another half an hour I was able to show her that the puzzle was solvable. The picture revealed by the button doesn't really give much away other than the arrangement but you might prefer not to click to reveal it until after you have solved it yourself. Solved it! Even got the etched name facing upwards. This one is absolutely perfect to hand to the non-puzzlers in your life. It is so tactile and looks so easy that they just cannot resist it. I have found that even resolving it myself is quite a challenge and have already managed to bamboozle David, my anaesthetic assistant, for a few hours with it. The Perforated puzzle is the final one in this release and I cannot really review it as yet - I have so far singularly failed to solve it! It is yet another of the stunning designs by Klaas Jan Damstra and like many of them consists of some very simple pieces arranged in a very complex way. The burr sticks in the rather beautiful frame are all identical and the simplest of sticks possible. Edit - after reading the information on the Pelikan store this version has been modified from the one on Puzzlewillbeplayed.com and has 2 different sticks. With a level 28.27.5.4.4.3.2.3 solution, this will be a very complex dance as the pieces wind back and forth around each other before one is released. Over the years many of Klaas' designs have been greatly admired on my blog and I fully expect to love this one once I have a little more time to play with it. This is a seriously fantastic puzzle with parities, confusing hidden bits and lots of shape-shifting too. Not for the faint-hearted but worth purchasing if you love your twisty puzzles. I bought mine from Martin's Puzzlestore but is also available from Puzzlemaster. 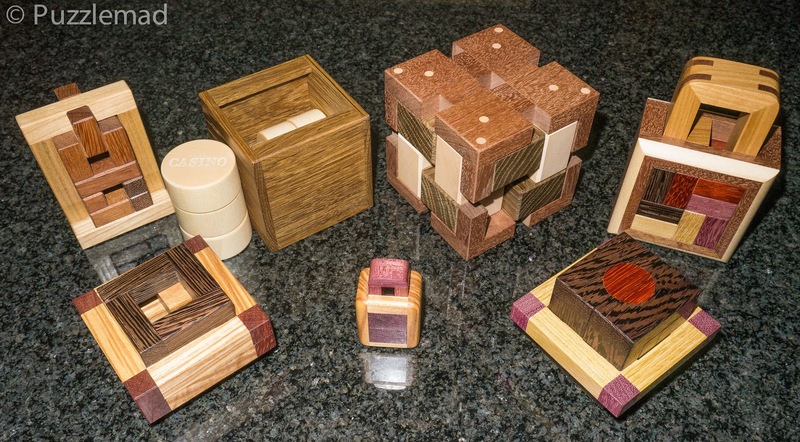 The latest twisty additions from Martin are Greg's Multi-cube and the Mo Fang Pentacle cube. 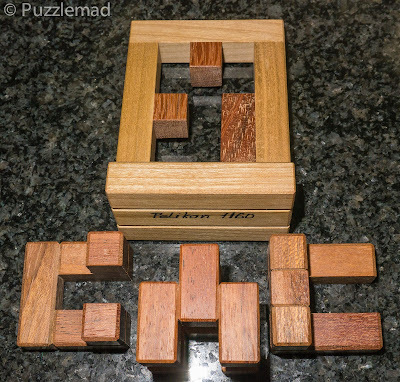 These look like a fun challenge which I'm told is not too hard (despite being a puzzle in a puzzle. I could do with something a little easier after the Wormhole/Mixup plus challenges. 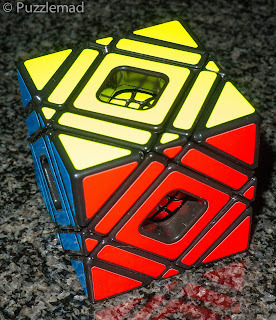 Finally, I was able to obtain a copy of the Six cube from Evgeniy Grigoriev. This was an entry in the London IPP design competition. 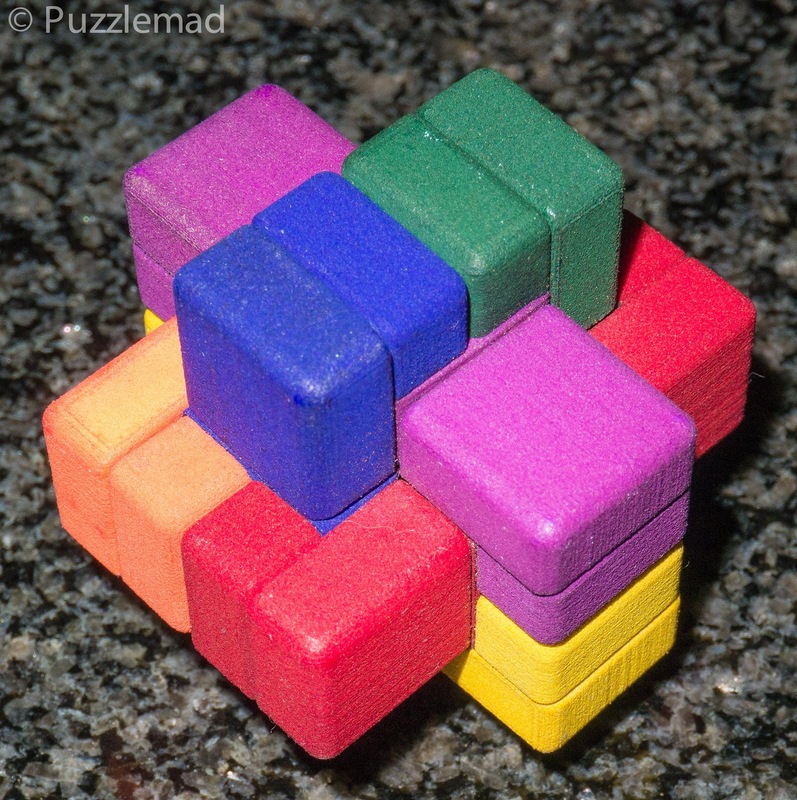 It looks like a six-piece burr but is actually a modification of a Rubik cube. 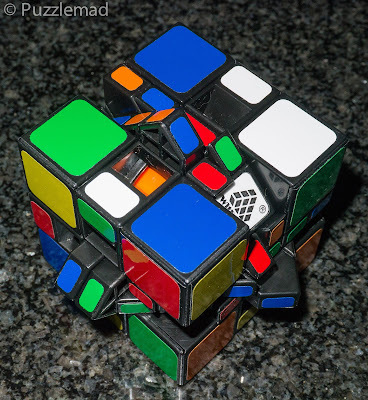 At that time it had me completely flummoxed - despite being "only" a simple 3x3 cube, I could not solve it. When Evgeniy put it up for sale, I couldn't resist having another chance to play and put it in my collection. Six Cube - looks like a burr, works like a twisty! The puzzles from Pelikan are available now and are mostly in limited numbers. Go get them, get ALL of them and make me feel better that I did too! 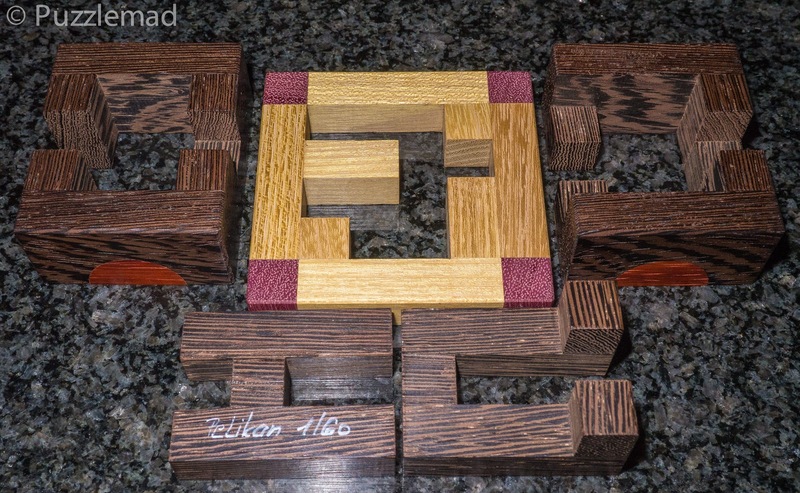 You will not be disappointed in either the quality or the puzzling! I looked on both the Pelikan site and on Puzzle Master and mostly these cannot be found (not listed on PM and "Out of Stock" on Pelikan). Are they just too new? I’m afraid that most of them sold out within 24 hours of my post! There might be a small number of the Casino available from Wil Strijbos in the future. How does one stay ahead of the game on these things? Puzzle Master in Canada has a selection of older Pelikans - maybe they bough a bunch of these and haven't listed them yet? I personally get advance notice. For others you just need to keep an eye on the Pelikan website and follow Jakub on Facebook. I would also love a copy of "Casino". 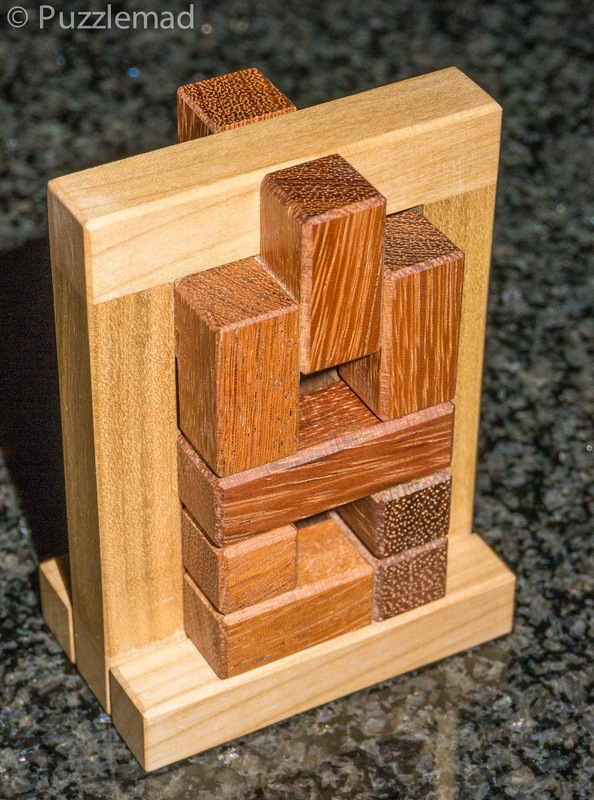 Since it won "Puzzle of the year", I am hoping someone in the USA can get permission to manufacture them. Eric Fuller, maybe? The Casino is being mass produced by Rombol.de - it’s not up yet on the site but should be quite soon. I see rombol has a whole bunch of volker latussek packing puzzles in stock (but alas, casino is sold out). Can you comment on the best ones to buy? Are bastille and tower of London as awesome as casino? I'm wondering if casino is so much harder to find merely because it won a prize OR if it's actually much better than the others. I have only played with Bastille which is clever and fun but not in the same league as Casino. I’ve no experience of the Tower of London but have been told it is also pretty good. Casino has sold quickly because it won a prize but then it did so for a reason...it was my best puzzle of 2018! Thanks for the info, good to know. I ordered a whole bunch of them and excited to give them a go. Will keep an eye out for casino and hope it is restocked at some point. I just saw that Eric fuller released a version (fancy and expensive!). But it was sold out by the time I got to it. The difficulty of finding these niche small batch puzzles sure is annoying, but it makes me feel special when I do get one! Two Balls are Better Than One! I'm a Puzzle Assembly Genius.....Or Maybe NOT!